Just look at the little guy. What’s the point of poetry? I know Robin Williams told us it’s to woo women, and there might be some truth to that– the first recorded words of man were a poem about a woman (Genesis 2:23). I used to think the point of poetry was to express thought and feeling more poignantly than is capable with prose, but I’m not so sure anymore. 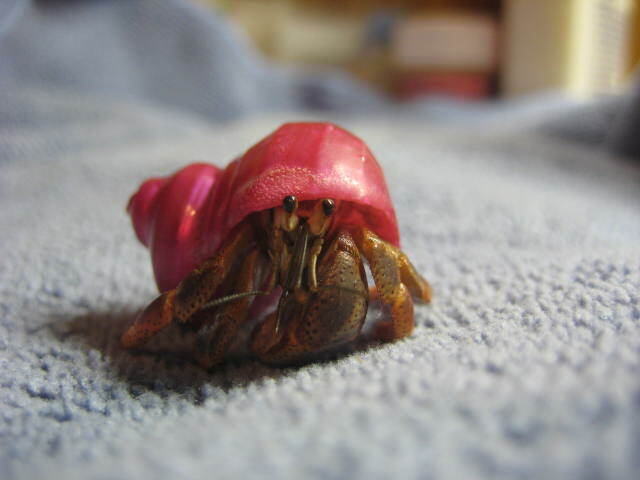 I think poetry is to the consciousness what a shell is to a hermit crab. It gives us space. Specifically, space to think and express. We don’t need poetry to survive, or even to communicate; but those of us who enjoy poetry know that it can give us words to say when we have none, or add depth and height to expression and emotion. A line of poetry or a poetic phrase that just fits is like… well, I suppose it’s like apples of gold in a setting of silver. I’m not a deconstructionist, and I’m not a postmodernist. I believe that words and phrases have meaning. The meaning of a poem comes from the author, not the reader. But poetry, like all art, exists in time. It’s written, then read. If it’s any good, it keeps getting read. Some people talk about it. Other people listen. Lines are appropriated in other poems, movies, prose, music. They rebound and echo off of our cultural context, and pick up new meaning as they go along. From the author’s point of view, meaning precedes expression, but from the point of view of the reader, expression precedes meaning. This interplay between content and form can create some pretty jazzy metaleptical feedback. Poetry shapes readers and is shaped by them in return, as they share their insights with other readers who will never be able to view this line, this poem again without thinking of that interpretation. Poetry shapes individuals, and it shapes communities. It does so on an affective level beneath that of ideas, able to access forbidden byways that proposition cannot touch. I wonder if this is why so much of the Scripture is written in poetry.